“The Singapore Navigators have a rich history of sending missionaries. But who have we sent long-term recently? 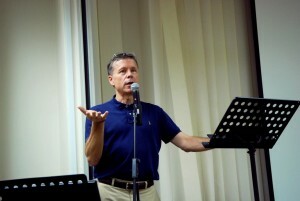 Just William Tew to the Philippines, and that was seven years ago. Are we making progress? Yes. Virtually all of our ministries sent a short-term team last year. And now Nissi Goh has said she is willing to go to Kolkata for a 2-year mid-term assignment. How do we build on this? Keep sending short-term teams. Work at sending mid-termers. And some here will need to go long-term. Will there be risks in going long-term? Anytime we travel overseas there is a risk. We could even lose our lives like the missionary Jim Elliot who, along with four other young men, was martyred in the jungles of Ecuador in the 1950’s. Interestingly, their martyrdom inspired a whole generation of people across the world to give their lives to the Great Commission. When we go we try to minimize the risks, but we still go. Will there be costs? I can imagine some of us having a conversation with God when we get to heaven: ‘Why didn’t you go?’ He asks. ‘Well, I wouldn’t have gotten to see my family as often.’ He responds, ‘What about that new technology called Skype?’ We continue, ‘Well, my children would have missed a Singaporean education.’ He asks, ‘What about all those excellent international schools?’ Finally, pressed into a corner, we ask, ‘Have you ever heard of the Hokkien word, ‘kiasu’?’ Missions is always going to be costly. But do we pay the costs? Yes.